« Ward committee? Councillors? Places directorate? No – Waitrose did it! The Attwood Awards were inaugurated by Sir Adrian Cadbury and economist James Robertson in 2002. They celebrate work done in this country to further any of the three aims of the city’s first MP, Thomas Attwood. Seven of the fourteen recipients came from the West Midlands: brief summaries of all 14 may be seen here. 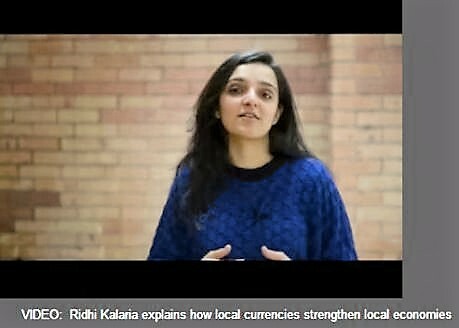 Ridhi Kalaria (Ort Gallery) received the 15th award last week at a meeting of the West Midlands New Economics Group in The Warehouse, Digbeth. She has been working in her spare time to set up a local currency. One of several advantages is its potential to enable and encourage local businesses to source locally wherever possible, shortening the supply chain, strengthening local economies and furthering the common good. As Bev Hurley, CBE, CEO of YTKO says: ‘Smaller businesses remain engines for growth, creating 60% of all private sector jobs and £1.6 trillion of revenue . . . The success of a small business doesn’t only impact its owners; it has a ripple effect throughout the local economy. The whole point is if we can make [small business owners] more resilient and grow, and improve their profits and turnover, they will take on new people and create new jobs”.